Home / News / How to Create a Digital Brand? The rise of social networks has disrupted traditional codes in terms of branding. In particular, the transformation of consumers into consum-actors has had a profound impact. Consumers are now also actors who share their experiences on the web and play a key role in determining a brand’s reputation. How can companies transform their brand into a digital brand? For decades, a brand was associated with a product. The brand had an image that was conveyed through a name, a logo and a style guide. However, brands now have the added task of conveying a company's reputation in terms of specific characteristics (societal or environmental responsibility, luxurious, etc.). "These new characteristics are particularly important in the digital world," highlights Régis Faubet, head of digital communications at Grenoble Ecole de Management. “The development of social networks has led to consumers having many more choices,” says Régis. Not only do they have choices, but they can voice their opinions. Consumers play a unique role in representing a brand in either positive or negative terms through social networks, videos, photos or comments. This evolution changes our traditional concept of who represents and manages a brand’s reputation. Consumers play a unique role in representing a brand [...] This evolution changes our traditional concept of who represents and manages a brand’s reputation. You can no longer think in terms of a single brand message that goes from the company to the consumer. Instead, companies have to consider bilateral exchanges. The response has been to develop the customer experience. In addition to a brand message, companies must deliver this experience, which includes visual content, a particular tone, specific behavior and much more. When put in digital terms all of these factors become essential for a company’s brand image. Ten years ago, the logo was still considered the primary interface for a brand. “In terms of brand management, we traditionally used to think only about visual characteristics. We tended to forget characteristics such as a brand’s tone and behavior. But these characteristics also require design. That’s why new jobs have emerged such as experts in customer experience, information architects or content strategists,” explains Régis. 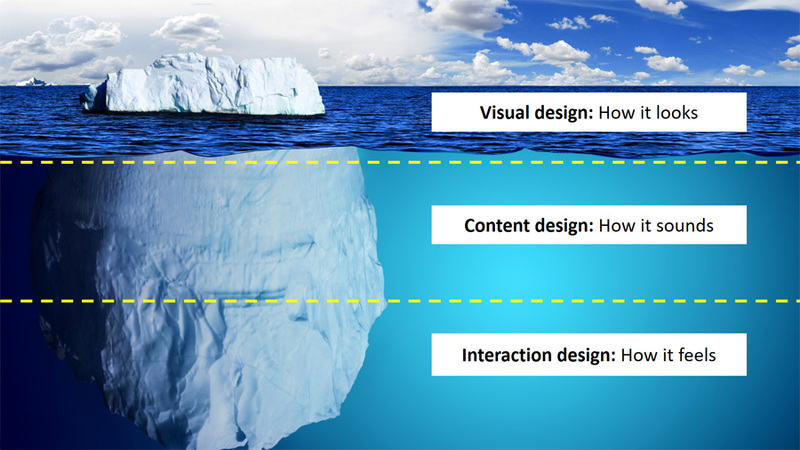 Components of the digital brand: content and interaction design are as important as visual design, but less "visible". Currently, digital brand management can no longer be effective without a strategy for content marketing. The goal is to build closer relationships with customers. The approach by many brands is to provide complementary information. For example, a flour-producing company might offer cake recipes or a tire manufacturer might explain how to change your tire. Traditional communication tools have lost pull with consumers while these new forms of content provide customers with information they seek all the while communicating the brand’s value. The current issue is the fact that all brands are trying to achieve success using the same methods (providing consumers with free and useful content). As a result, there’s a real race to try and stand out from the crowd with innovative content. “Individual opinions posted online are currently the most important factor. As a result, it’s essential for brands to develop strategies that enable them to connect with individuals who represent the brand in this manner. This has led to the creation of brand ambassadors,” underlines Régis. For example, GEM decided two years ago to allow various company profiles such as professors and researchers to communicate more freely use the brand name. As a result, each individual has had to learn how to manage communications within his or her community and target audience. "Managing the Digital Brand" on Slideshare.